The Nationals' director of field operations, John Turnour, looks over his domain. Turnour inspects a single blade of grass. National Park's classic, checkerboard field, taken from second base. So, about 24 hours before the first pitch of the season at Nationals Park, home of the Washington Nationals, the team's director of field operations, John Turnour has a lot on his mind. Turnour studied turf management at North Carolina State University, then worked in the minor leagues before getting an assistant job with the Baltimore Orioles, then the San Diego Padres. This will be Turnour's 16th MLB season total, and his ninth season as the Nationals' head groundskeeper. His length of tenure is evident: Nothing escapes his attention, not even single blades of grass. "We can also pull out a leaf blade and just kind of inspect it to see where that cutting point is from the mower," he said. "And if it's a nice clean cut like we have right there, we know that we've got a good cut from our mower. If we've got a bad cut, that will become very jagged." 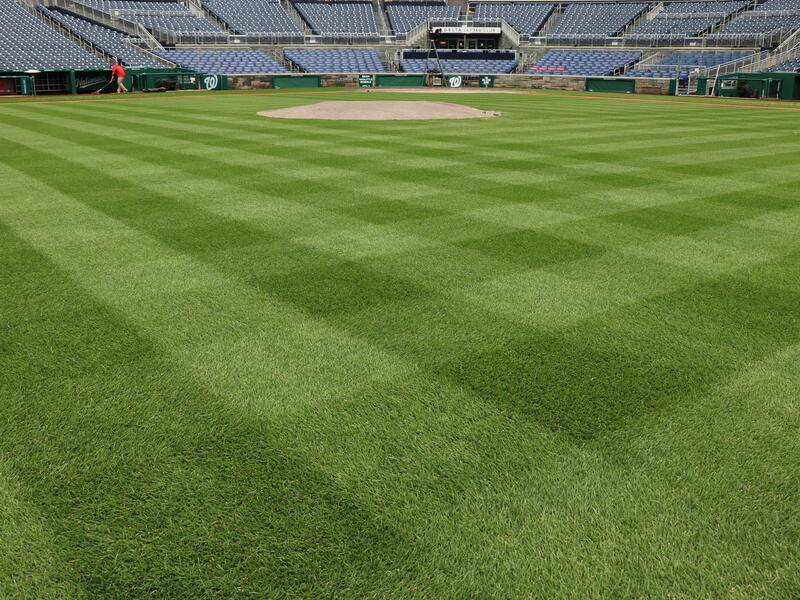 On game days, the Nationals Park field can be mowed anywhere from one to three times a day. Turnour and his team of 42 people mow, water, edge and rake with painstaking detail to give the field the gleaming quality that professional ones are renowned for. Turnour spent decades learning how to maintain a pristine baseball field. He decided early on he wanted to be a groundskeeper, but that wasn't his initial plan. "I think every kid growing up they always think they're going to be the next baseball player out there," he said. "I think that quickly comes into realization as you go through high school that's probably not going to happen. At least I figured that out pretty quick." But unlike most aspiring major leaguers who reach that reality check, he figured out a way to work in the majors. "My brother and I, we had a baseball field in our back yard," he recalled. "We had a pitching mound. We had bases. We tried to mow mowing patterns." But those mowing patterns never quite worked for Turnour and his brother: The mowers that even the most dedicated lawn aficionado tend to use aren't built to create the sleek cuts of professional baseball. Turnour says he's often asked how to recreate the look of his field, but in order to do so, you'd need the special mowers his team uses. He explained it's not the blades of his mowers that create the famous checkerboard patter, but the rollers. "There's a roller on the back [of the mower]. ... So when [a mower] is going away from you, that roller's pushing all that grass away from you," Turnour said. "All that grass is generally bent over this way, giving it that light effect." Some teams go all out with their grass patterns — the St. Louis Cardinals regularly sculpt their city's famous arch into the outfield. Turnour and the Nationals keep it much more straightforward. From an aerial view, their field resembles a checkerboard. The day after Turnour spoke with NPR, the Nationals lost to the New York Mets, 8 - 2. But the outfield patterns looked beautiful — dark green and light green in three distinct shades, immaculately checkerboarded across the infield and outfield grass, thanks to Turnour and his team. Major League Baseball players have more than a month to get ready for the season and shake off the rust. But there's no spring training for the grounds crew. There isn't much prep time before opening day, when the field has to be perfect - not too wet, not too dry. The infield has to be smooth. And the grass has to be just right, so ground balls don't slow down too much or skip too quickly. 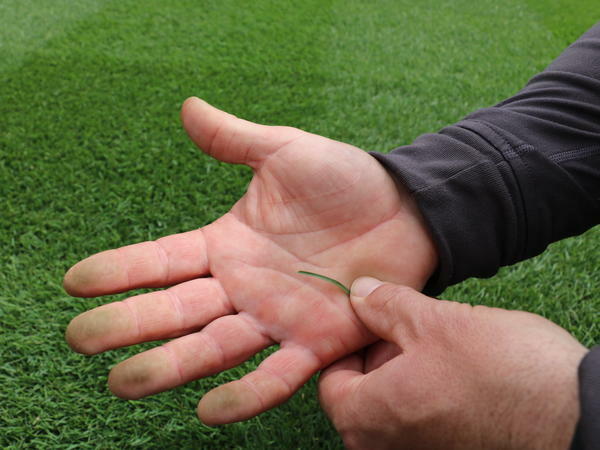 JOHN TURNOUR: So on game days, this field sometimes can be mowed anywhere from one time all the way up to three times a day, depending on the pattern we have out here. 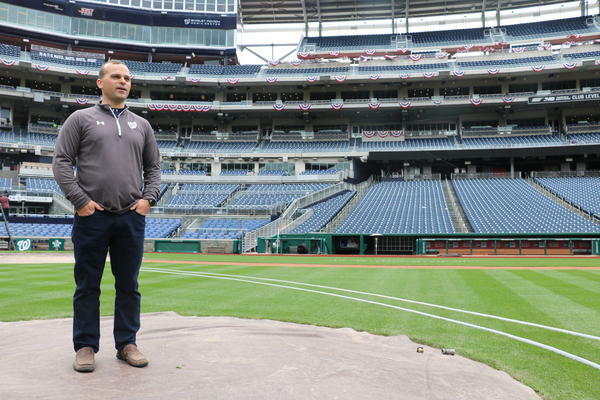 DETROW: So about 24 hours before the first pitch of the season at Nationals Park, the team's director of field operations, John Turnour, has a lot on his mind and a lot to keep track of. As we stand behind second base, there are people mowing, watering, edging and raking. Nothing escapes Turnour's attention, not even a single blade of grass. DETROW: Yeah. It's safe to say Turnour probably spends way more time thinking about grass than you ever do. What do the fans ask you about the most? TURNOUR: ...And, how do I make my lawn look like this at home? DETROW: The patterns in the outfield grass - they're one of the first things fans notice walking into the stadium or when they're watching on TV. Some teams go all out. The St. Louis Cardinals regularly sculpt the arch into the outfield. Turnour and the Nationals keep it much more straight-forward. TURNOUR: If you were to look at the field overhead, you're going to see what would resemble a checkerboard. DETROW: Turnour understands why fans want tips to checkerboard their front yards. He tried to do it as a kid. TURNOUR: My brother and I - we had a baseball field in our backyard. We had a pitch mound. We had bases. And we tried to mow mowing patterns. We had foul poles. DETROW: But those mowing patterns never quite worked out when Turnour was little. TURNOUR: The mowers at home generally aren't built to provide this result. DETROW: Is it the blades? Is it the roller? TURNOUR: It's not blades. It's the roller that's on the actual unit itself. There's a roller on the back. So when he's going away from you, that roller's pushing all that grass away from you. TURNOUR: So if you were to go out there, all that grass is generally bent over this way, kind of giving it that light effect. DETROW: So this light stripe going from right behind second base to the center field fence - that's all mowing one way. TURNOUR: And then the dark one is just coming just reverse of that. DETROW: Turnour spent decades learning all of this. He decided early on he wanted to be a groundskeeper. Of course, that wasn't the initial plan. TURNOUR: Every kid when they're growing up - they always want to - think they're going to be the next baseball player out there. And I think that quickly comes into realization as you go through high school, that's probably not going to happen. At least I figured that out rather quick. DETROW: But unlike most aspiring Major Leaguers who reach that reality check, he figured out a way to work in the majors. Turnour studied turf management at North Carolina State University and worked in the minor leagues before getting an assistant job with the Baltimore Orioles, then the San Diego Padres. This will be Turnour's ninth season as the Nationals' head groundskeeper. What's the stress dream for a groundskeeper? Is it, I messed up the outfield pattern? Is it the ball, you know, hits a bump in the dirt and hits the shortstop in the face? Is it the tarp coming loose? I mean, it seems like you've got a lot of stuff to worry about. TURNOUR: Everything you mentioned kind of hits us a little bit. Playability will always kind of haunt me a little bit. We never want to be the cause of a negative outcome of a game. So whether it's a bad hop out here or something's going on with the mound or the plate, we try to minimize those and try to avoid those at all costs. DETROW: The next day, the Nationals lose to the Mets 8-2. But the outfield patterns looked beautiful on TV - dark green and light green in three distinct shades checkerboard across the infield and outfield grass. Today brings new challenges for Turnour and his staff here in Washington. There's snow in the forecast. Transcript provided by NPR, Copyright NPR.